Natural Disasters (A Love Story) by G.F. Cantrell is a captivating tale about love: past loves, new loves, self-love. Intelligent and optimistic Maggie Chisholm knows she’s in big trouble from the moment she lays eyes on her new contractor, Finn. Their easy-flowing conversations are full of humor and depth, something she can’t imagine having with her controlling, tyrannical husband, Martin. In fact, he’s the complete opposite of Finn’s down-to-earth ways, which only confirms what Maggie has been avoiding for so long; another dreaded divorce. Unable to stop thinking of one another, the two are filled with the giddiness and joy of newfound love, but also hesitation, as they wonder if they’re in way over their heads. Could they have really found the greatest love either of them has ever known? Told from both perspectives, their accounts of how each encounter bonds them further and further into the depths of their souls are quite different. Does true love and happily-ever-after exist? Or will they discover that it just might mean something different to everyone? Natural Disasters is a thought-provoking read that drew me in from the first paragraph. Many married adults find themselves in these types of unforeseen circumstances, and I loved that it wasn’t based on a group of twenty-somethings, but actually seasoned, experienced adults who’ve been through divorces, raising children, health issues, and, yes, dealing with contractors when renovating your home. Well-written, full of twists, and I liked that it was told from both characters' viewpoints. (And we all know that men and women think very differently!) I’m always happy to read books that support self-love and lifelong happiness. Five stars. In Natural Disasters, A Love Story, G.F. Cantrell explores human relationships, morals, and love and lust. The main protagonists are Maggie and Finn, but Maggie’s second husband, the manipulative Martin, lies at the core of the story. Finn enters Maggie’s life when flood water damages the upmarket Arizona home she shares with Martin, and he is called to estimate the cost of making good; it’s his job, and he needs the work. Maggie, mother and grandmother, has a history of childhood abuse. Is that why she became a therapist? Is it the reason she cannot take the final step to divorce, or is it fear of Martin? Finn too has a record of failed relationships and a determination to stay free. Does he, or is his attraction to Maggie too strong to resist? Natural Disasters, A Love Story is an in-depth, exquisite work of literary fiction that moves at a deliberately slow pace, and it deserves to be read unhurriedly; it is full of intriguing ideas that prompt readers to evaluate their own lives. Are we the product of our background and upbringing? Do we unconsciously choose partners that mirror a parent? However, it is also a powerful, graphically passionate narrative: haunting, memorable and, in the end, both surprising and satisfying. Cleverly written from both Maggie's and Finn’s points of view – often in flashbacks showing their feelings and reactions to the same event – G.F. Cantrell’s Natural Disasters, A Love Story truly is a superb love story. Natural Disasters, A Love Story is a work of women’s fiction by author G.F. Cantrell. Maggie Chisholm, our tough central character, is stuck in a marriage where the love faded long ago, but she has given in to staying despite her apathy, too tired to fight the fight for the divorce she deserves. An older woman who has given up on love, Maggie has shock after shock once the floodwaters burst in and ruin her Arizona home. When Finn arrives, ready to fix her floors, he’s drawn by the spirit he can see trapped in a dull life, and when Maggie befriends him, a host of possibilities and problems arises. It’s always wonderful to see romance novels where the protagonists are significantly older than your standard fresh out of college kids. Maggie is written in such a compelling, relatable way, stuck in her life in much the way that many women are, and the fact that it takes an epic natural disaster to shake her awake is both ironic and amusing. Her marriage with Martin is fascinating to unpick, and her developing relationship with Finn reads in a highly uplifting way as the story unfolds. I had already guessed that the book would have some religious themes because of the earlier ‘act of God’ in the story, but I felt they were delicately placed and quite appropriate to the plot. 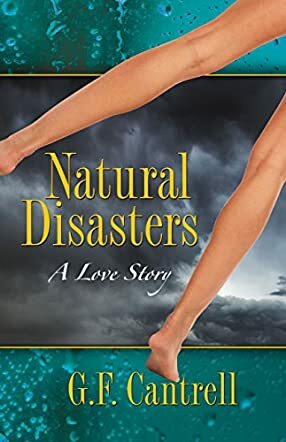 Overall, G.F. Cantrell has done a wonderful job, and I can’t recommend Natural Disasters, A Love Story enough to romance fans.